Management of chronic tibial subluxation following a multiligamentous knee injury is an uncommon but challenging pathology that requires meticulous preoperative evaluation and planning to maximize patient satisfaction and postoperative outcomes. Knowledge of both ligamentous and osseous anatomy and their role in knee biomechanics is important to an anatomic reconstruction. 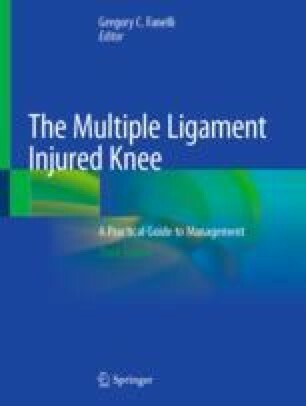 This understanding is particularly crucial in the setting of chronic tibial subluxation in the multiligamentous knee injury, as an absence of the normal anatomic landmarks and ligamentous restraints may exist. Optimal reconstruction and outcomes in this setting require the surgeon to establish a careful balance between knee stability and range of motion. In order to achieve this balance, three sequential operative steps should be followed: First, excise all scar tissue to maximize uninhibited knee range of motion; second, reconstruct the anterior cruciate ligament (ACL) and posterior cruciate ligament (PCL) to establish a central knee axis of motion; and finally, following possible reconstruction of the medial and lateral complexes, carefully maintain postoperative stability and range of motion with a functional knee brace. Close clinical and radiographic follow-up will aid to achieve an optimal postoperative result in this complex clinical situation. If the chronicity of the injury has progressed to the point of maladaptive osseous changes, success with operative intervention to restore stability and functionality is unlikely, and therefore nonoperative management or salvage procedures should be considered.